Nambu ironware generally has certain thickness and weightiness that facilitate even heating and good heat retention; that in turn ensures perfectly cooked food, cooked all through and crisp surface when needed. Nambu ironware is very popular not only in Japan but also overseas for its high quality and excellent designs (both traditional and innovative) as high-end, heirloom cookware that will be cherished for generations. • Even heating and high heat-retention of Nambu cast iron ensures superb taste and crispy skin. 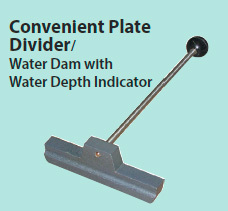 • Plate Divider lets you cook just one serving while retaining the appropriate water depth. • Timer lets you adjust the cooking time to your preference. • Easy to use; the thermostat keeps the cooking temperature at desired point. • Electric heater for safe, clean and economical operation. • No heat-generating open ame; lower ambient temperature; less air conditioner use. • Compact size, yet loaded with convenient features. 2. Wait until the temperature rises to the set point. 3. Oil the plate; then place the dumplings. 4. Add hot water up to the edges of the dumplings. 6. Drop some oil; the dumpling are ready to serve.